Harold McLeod Quinn was born at Lot 9 Concession 10 in East Nissouri Township. His parents were Daniel and Ada (nee McLeod) Quinn. 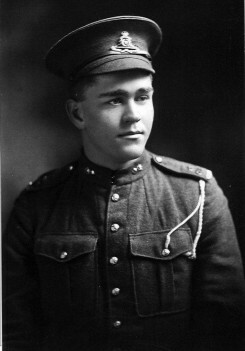 Nineteen year old Harold volunteered for active service in May, 1918 and was with the 63rd Battery, Canadian Field Artillery, Canadian Expeditionary Forces. He was discharged in Jan of 1919 and did not see overseas service. Harold married Mabel Elizabeth Sutherland on January 1, 1924 and together they raised three children. Shirley, Ruth and George. Harold farmed the 'home farm' at Lot 9 Concession 10 all of his life.